It’s time to celebrate an exciting new fall season in Southern California. Below are several events to look forward to. The LA Phil is having it’s centennial and most ambitious season. Running the gamut from stunning live music to unexpected collaborations. To begin the festivities and celebrate the 100th season there will be a free 8-mile street party on September 30 starting at 9 am, running from Walt Disney Concert Hall to the Hollywood Bowl, featuring a live broadcast on KUSC. It is a collaboration with CICLAVIA. On October 4, Gustavo Dudamel, Music and Artistic Director of the LA Phil, will conduct the orchestra and they kick off the 100th season with LA Fest at the Walt Disney Concert Hall, featuring music by Beethoven, Salonen, and a new work by Andrew Norman. It is a celebration of everything the LA Phil stands for, a once in a century event. 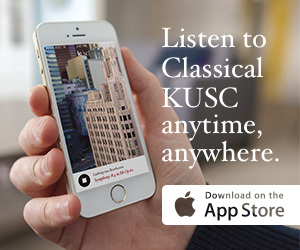 If you can’t make it to the concert hall, be sure to tune in to KUSC to listen to our live broadcast. Started in 1939 as Evenings on the Roof. MEC is one of the longest-running series in the world devoted to contemporary music. This season continues the investigation of the pairings of music composed centuries apart from one another and demonstrates something timeless about art and the creative spirit. The 79th season begins on October 5 at the Wende Museum of the Cold War (‘An Odyssey’) with music including works by John Cage, Lukas Foss and others. There will be programs at Zipper Hall and other sites that are historically significant to MEC. Some of the musicians will include the JACK Quartet and a Marino Formenti Residency. To quote Jonathan Hepfer, Artistic Director, percussionist, conductor and curator – “Mahler said it best – Tradition is not the worship of ashes, but the preservation of fire”. The Master Chorale opens its 55th season on September 22 with the Mozart Requiem and Shawn Kirchners Songs of Ascent conducted by Artistic Director Grant Gershon in the Walt Disney Concert Hall. The performances will feature the full 100-voice Master Chorale and Orchestra plus Rod Gilfry and other soloists. There will be a pre-concert talk at 1pm with KUSC’s Alan Chapman and Grant Gershon. The Master Chorale has just announced its tour dates of internationally renowned festivals and venues of its acclaimed production of Orlando di Lasso’s Lagrime di San Pietro directed by Peter Sellars. The first performance will be held at the Ravinia Festival in Illinois on September 13. Jacaranda presents its 16th Anniversary season in musical adventure “Dream in Color.” There will be 6 concerts in the season from Mattingly to Mozart starting October 20th. Amazing composers including Pavel Haas, George Walker, and Julius Eastman. Also amazing performers including Althea Waites, Gloria Cheng, and the Lyris Quartet. Plus the best program notes anywhere written by Patrick Scott, curator and founder. There is a Sanctuary Series of pre-concert talks before every performance at 7pm. The concerts are held in Santa Monica at the First Presbyterian Church, 1220 2nd Street. It’s a wonderful setting for an evening of chamber music. Piano Spheres was started by Leonard Stein 25 years ago with a program of Arnold Schoenberg’s works in honor of Schoenberg’s 120th birthday. They have compiled a repertoire of 775 works to date of the best contemporary piano music and are looking forward to new compositions in the future. Piano Spheres opens it’s 25th season September 11 at Colburn Schools Zipper Concert Hall with Mark Robson’s “The Debussy Project” acknowledging the centenary of Claude Debussy’s death. There will be 6 concerts this season including original members Gloria Cheng, Vicki Ray, and Susan Svrcek. Among the outstanding concerts will be Gloria Cheng’s commissioning 33 composers to pay tribute to well-loved composer Steven Stucky. On to the next 25 years. LACO is celebrating its 51st anniversary “female-centric” season with its opening concert featuring three-time Grammy award-winning violinist Hilary Hahn performing Bach’s Concerto for Two Violins. Fifteen years ago, Hilary Hahn and concertmaster Margaret Batjer made and released a recording of the piece. They will be performing it together on September 29 at the Alex Theatre in Glendale and September 30 at Royce Hall UCLA. The concert conducted by Gemma New also has music by Donatoni, Mendelssohn, and LACO Creative Advisor and Composer-in-Residence Andrew Norman. There will be six more concerts with three world premieres.